So versatile that it took the whole world by storm. Truly multi-mission, the Grand Caravan EX is the top model of the well established Caravan line, the aircraft that never stopped reinventing itself. Such versatility has made Cessna's most famous turboprop an absolute success, with over 15 million hours flown and more than 2,500 units sold worldwide. Understand why the Grand Caravan EX is a grand airplane. No matter what your mission, the Grand Caravan EX serves you perfectly. Its large cabin enables quick reconfiguration, adapting perfectly to any need, either for transporting cargo, luggage, or up to nine passengers (plus the crew). The aircraft can still operate on more than 99.8% of the registered runways in Brazil, thanks to its ability to land and take off on short (only 426 m) and adverse runways, such as in grassy fields or dirt. 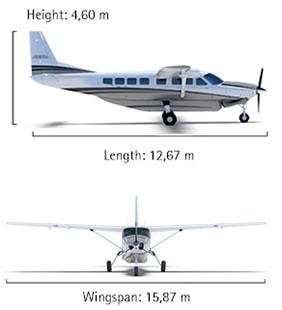 The Grand Caravan EX offers better climb performance and higher cruising speed than its predecessor, and is able to reach 185 kts (343 km/h), get up to 25 thousand feet of altitude, with a maximum range of up to 1,689 km (at 10,000 feet in economy cruise and 45 minutes of reserve), which allows you to fly from São Paulo to Cuiabá nonstop. Great for operations on farm runways, the Caravan 675 perfectly serves typical agribusiness missions, which usually involve heavy loads and long distances. The Grand Caravan EX comes equipped with Garmin NXi avionics, recognized as one of the most reliable in the world. Timeless but with significant developments over the years, the design of the Grand Caravan EX has become iconic for aviation lovers. Big in comfort too, the Grand Caravan EX comfortably accommodates up to nine passengers (plus crew), or can be configured to carry luggage, cargo or even, in specific versions, parastatal agencies. *Outside of Brazil, the aircraft is available in other configurations with more seating. Consult local regulations.